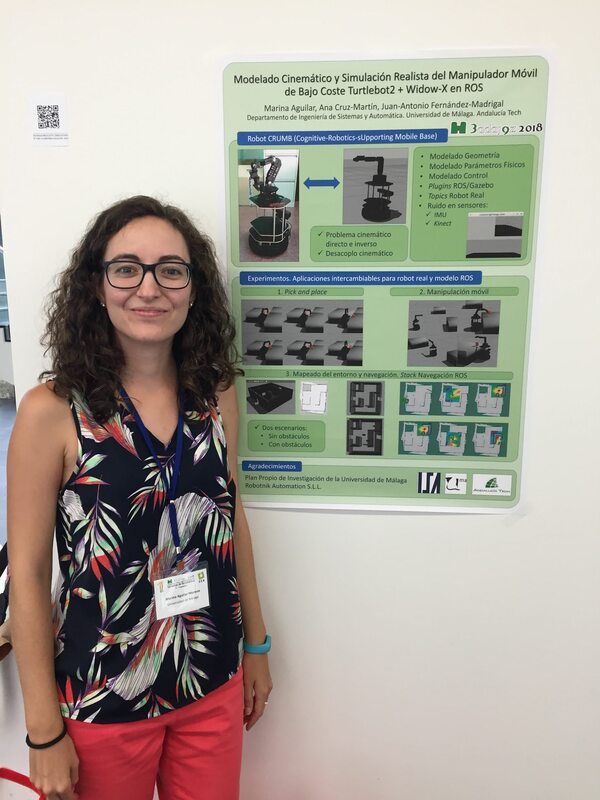 Marina Aguilar has taken the CRUMB simulator for ROS she developed for her MSc thesis to the national conference “XXXIX Jornadas de Automática”. A paper by Manuel Castellano has been accepted and recently presented in the national conference “XXXIX Jornadas de Automática”, in September. 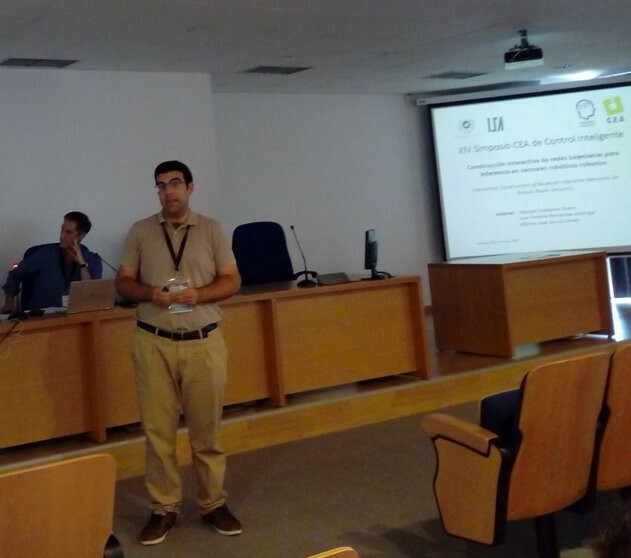 Manuel Castellano has done a nice speech at the XIV Simposio CEA de Control Inteligente about “Interactive Construction of Bayesian Inference Networks for Robust Robot Sensorics”. 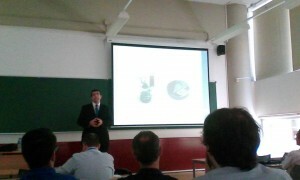 He has summarized his work on the semi-automatic construction of bayesian networks intended for the sensory diagnosis and augmentation in mobile robots. That work has used the CRUMB robot for the experiments. 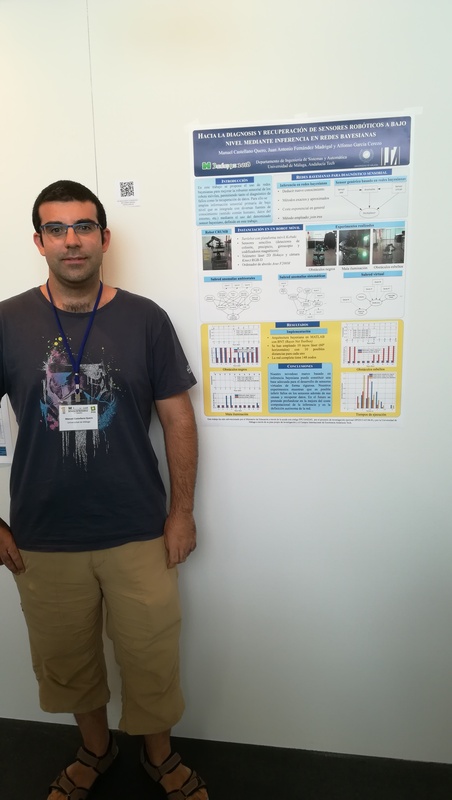 As part of the work of Manuel Castellano Quero, he has published a paper at the Jornadas SARTECO that proposes a novel sensory architecture for mobile robots that is more robust and intelligent than common ones through the use of bayesian inference. He has used the V-REP simulator of CRUMB for conducting many tests in that paper. In this paper we present a novel architecture for the sensory apparatus of a mobile robot that integrates artificial intelligence to both expand and improve the capabilities of the system. In particular, our architecture allows us to create virtual sensors that the robot does not have, based on Bayesian inference from other sensors; in addition, we can detect anomalies in existing sensors, also through Bayesian inference. We have implemented the architecture first in a realistic physics simulator and then we have embedded it on-board a real mobile robot. Our experiments show that the computational cost of the execution of the inference methods is suitable for a reasonable number of basic sensors, and that the results of inference can effectively improve and extend the sensory capacities of the mobile platform.